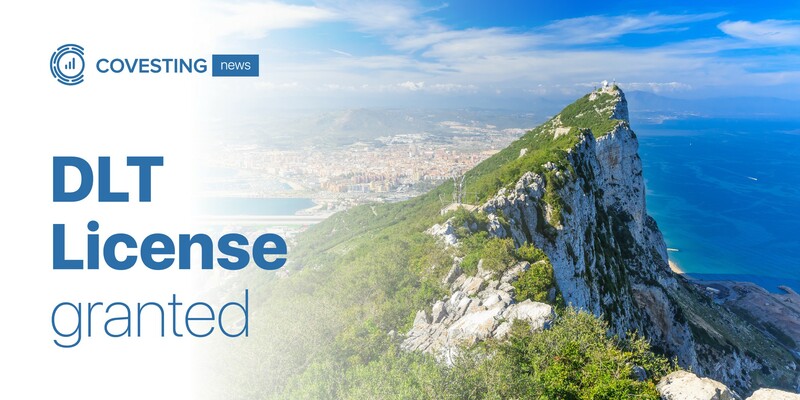 After months of hard work, the Covesting team is pleased to announce that we have officially received our Distributed Ledger Technology License from the Gibraltar Financial Services Commission, validating Covesting’s mission of being a compliant, secure, and transparent cryptocurrency exchange that offers clients an unparalleled level of reliability and compliance. “We are very excited to become one of the first companies to receive a DLT providers license and offer fully compliant cryptocurrency trading services to all of our customers. 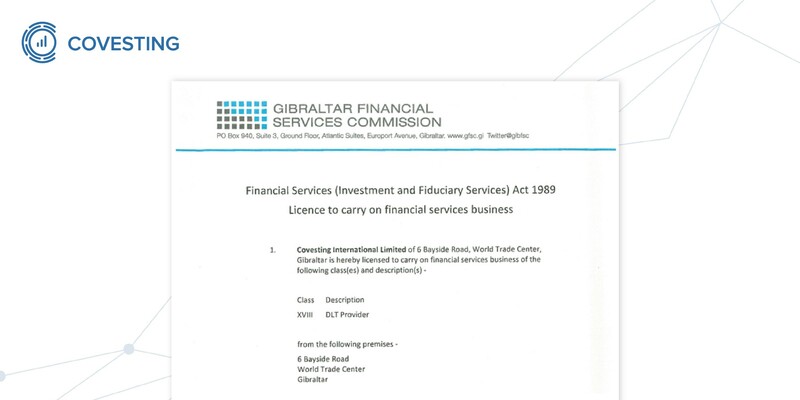 It is a pleasure to work closely with Gibraltars Financial Services Commission. In order to receive a DLT license, we had to prove to regulators that we meet a series of strict regulatory principles of corporate governance, capital requirements, compliance, security and many other guidelines that ensures services we offer meet the highest standards. It took us a long time and a lot of work to receive our DLT License, and every aspect of our exchange and our management team was closely scrutinized by regulatory authorities. In order to remain transparent and compliant, the team has adjusted internal policies, procedures, and has implemented the highest quality digital security features available. While developing our internal policies and procedures, we consulted with the relevant industry experts: attorneys, external consultants, economists, and security specialists, in order to devise a platform that operates with the best practices in the industry. In order to receive the DLT License, Covesting had to meet the GFSC’s strict regulatory framework. 1) We had to the prove to the GFSC that we are conducting our business with honesty and integrity, and in order to do this we have on-boarded a world-class team of experts with years of experience under their belts. 2) We also had to prove to regulators that we have put in place procedures that pay due regard to the interests and well-being of our clients, and that our communications with them are clear, honest, and fair. Covesting has put together a top-quality support team to help carry out this mission. 3) One issue of great importance to regulators is that companies with a DLT License effectively manage their business, while properly managing risks by maintaining adequate financial, and non-financial resources. 4) The Covesting team is also committed to a platform that is not abused in any way by criminals for things like money-laundering, terrorism financing, or tax evasion. We have put in place strict and thorough KYC/AML procedures, approved by regulators, that help us to stop these types of activities from occurring. In addition to having a suite of institutional-grade features, Covesting has implemented a strict and thorough corporate governance arrangement that will ensure our security and privacy features always remain on the cutting edge. Also, another benefit of trading on a licensed exchange is that clients will be able to access a fully legal compliant fiat gateway. We have already secured multiple banking relationships. “The GFSC has a high regarded reputation as a global regulator, and they would never do anything to risk their reputation. That is why they only offer licenses to companies that fully meet their high standards. For this reason, we are incredibly proud that we received DLT Providers License and would like to offer a huge thank you to all the team and community members that have helped us to fulfill our goal”, — said Tim Voronin, COO of Covesting. Because Covesting is one of the first exchanges in the world to receive this type of licensing, our reputation has been bolstered by this news, and it is allowing us to continue to expand our expertise and to continue building relationships with global regulatory authorities. We are proud of Covesting’s latest achievement and are excited to continue sharing this journey with all our community members who have offered us unprecedented support. As always, we are happy to answer any questions you may have regarding our platform, the DLT License, or anything else. Please navigate to this page for information on how to best contact us. See you on our platform soon!